'Tis the season for gift ideas... with Christmas coming, here are some of the books that have been favorites in our household this year! 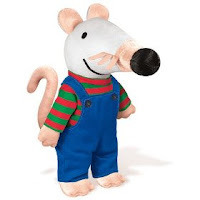 I'm not a big stuffed animals fan but our son loves Maisy (published by Candlewick Press) so much and seems to be identifying with characters (like Pooh) and so I "stooped" and went ahead and bought him the stuffed Maisy with overalls for Christmas. I don't mind stuffed Storybook characters so much though because they attract my son to the books. It's an easy way to promote books to a two year old. - Dinosaur Picture Pops (huge realistic dinosaur pop-ups... every little boy's dream!) These books are published by Priddy Books and I've reviewed them for 5 Minutes for Books. - Can You Cuddle Like a Koala? - Can You Growl Like a Bear? I reviewed these books over at 5 Minutes for Books also. These are awesome interactive books! We pulled these out for the boy's second birthday party and all of his aunts and uncles (and grandpa!) participated in acting out like the animals presented in the book. We LOVE these books by John Butler (published by Peachtree Publications). Next up, these books are exciting tales of adventure that can be enjoyed by all ages (including adults), with writing at about a middle-school level that younger kids would still enjoy being read aloud. In fact, I know several people who have been reading a few of these aloud as a family and are enjoying them very much! Spyology I reviewed this title over at 5 Minutes for Books. And for high-school or adult readers who enjoy reading, these more advanced titles are great picks! - Safely Home (Our favorite work of Christian fiction, by Randy Alcorn) Jonathan reviewed Safely Home and since his review was better than mine, take a look and see what you think! - The Ice Diaries (Recently reviewed over at 5 Minutes for Books. - Leave It to Psmith (One of our favorite novels by P.G. Wodehouse.) You've probably read a lot more Jeeves & Wooster than Psmith and so he's a safer pick in the gift department but just as funny and classic in perfect Wodehhouse style! And with that we're wrapping up the Christmas posts and moving on to an entire week's worth of discussion on Narnia! Love your list! I'd also recommend The Calder Game by Blue Balliett - all of Balliett's art mystery stories, actually, but I did enjoy the Calder Game the best. It's a perfect gift for a child who loves working with words, or art, or patterns/puzzles. I was thinking of doing something like this on 5M4B. I might do something and link up to any of the contirbutors' as well (including this one). This is a GREAT list. I thought of you, because I saw several Myster. Bend. Society books at TJ Maxx for only $5 (softcover) and Amanda has a bday party, so I bought one as part of the gift. Amanda was excited too. Great ideas! Finding gifts for readers can be so frustrating (I've learned not to try and buy them actual books). Thanks for posting, and just in time for the holidays!